John Bellows passed away from health issues in Toledo, Ohio on May 13, 2018. John was born on Nov. 27, 1967 in Miami, Florida to Peter and Anne (Noel). 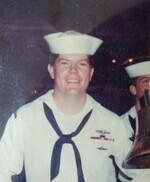 He served 10 years in the US Navy, 6 years as a sonar technician in the USS James Monroe, then later he served shore duty and as Military Police where he was later promoted as an investigator. He attended the University of Florida, where he graduated with a bachelor’s degree in Mass Communication and Criminal Justice. While serving his country John met his soulmate, Amy Halasz and they married in 1995. They have 2 daughters, Kellsie and Brynn. After moving to Toledo in 1998, John worked as a boiler operator for 15 years at BP/Husky Toledo Refinery and was a strong union member. He is survived by his wife, daughters, mother, brother Christopher, and sister Jane. John adored his family. His daughters will fondly remember him as a kind daddio who loved taking them to the art museum, building forts, camping in the backyard, and daddy/daughter date nights. He always encouraged them to pursue their dreams. John enjoyed walking his dogs, scuba diving, the beach, and loved watching sunsets and sunrises. He was passionate about helping people. John was a patriot who loved his country, he had a kind soul, and was smart as a fox. A celebration of life is on Sunday, May 20 from 5pm–9pm at the United Steelworkers Local 1-346, 2910 Consaul St, Toledo, Ohio 43605. Dinner will be available from 5pm until 7:30pm followed by a formal benediction. ‘Taps’ will be performed to honor John’s service, and at sunset a release of wishing lanterns to commemorate the sunset on Johns time here. For those that wish to toast to John and his memory, please bring your beverage of choice.